We headed south along the Icefields Parkway through some of the best mountain scenery on the entire planet. If there was one reason the border between Canada and the United States was set at the 49th parallel, this was it. 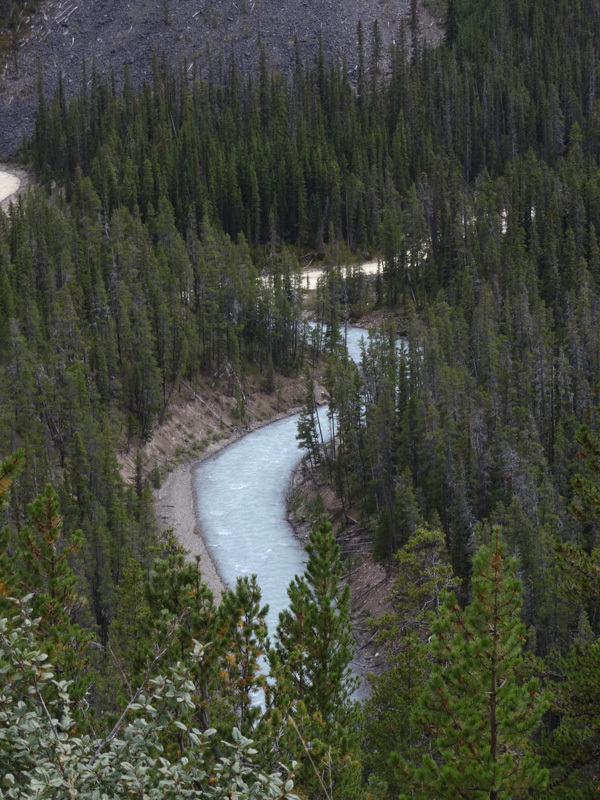 The British simply wanted to keep Jasper and the rest of the Canadian Rockies all for themselves. From the relative flatness of Hinton, we plunged headlong into the Athabasca River valley, completely dominated on both sides by huge thrusting mountains, layers of pinnacles and glaciers peering down into the waters. A 100 mile radius of the earth appeared to have at some point swollen up from inside its liquid mantle and pushed towards the sky, where it cooled, the magma splitting itself in two raggedly beautiful lines through which glacial waters now meandered south. Like a broken pie crust a child has dragged their finger through in search of fruit, the nearly vertical rock faces above us fell back much more gently away from the highway. The road ahead was full of big sweeping turns, along with a few tight hairpins, for almost 200 miles. At the top of the Sunwapta Pass the temperature dropped a good 15 degrees and the weather threatened to close in. 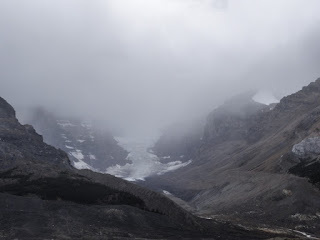 We paused for a photo op of the Athabasca Glacier at the Icefield Center and then pressed on for Lake Louise where Carol was growing impatient. Arriving a couple of hours later than we had planned, the road lived up to every hyperbole tourist magazines have heaped on it over the years. It was simply stunning and a great close to our fantastic journey. Carol was wandering in the car park near the local supermarket and about to leave for something better when we pulled up. After a cup of coffee, a short visit with a young woman who was adventuring with her Ural and her dog (in the sidecar), it was time to bid farewell and draw an end to the guy’s trip. With the weather closing in Sledge was keen to press on to Calgary for a new tire and start his journey south. As it was he missed a freak snowstorm that hit the Alberta plains by only 24 hours. There was never a time that I felt we were completely out of synch. Verity, Sledge’s BMW F800, and Lily, my Triumph Tiger XC, were well matched and they danced, sometimes together, sometimes apart - but always to the same songs. Watching Sledge pull out of the car park and head towards Calgary was tough. He’s not quite, as Natalie Merchant once described Jack Kerouac, "a hip flask slingin’ madman", but he could be, if he wanted to. As a traveling companion Sledge is as easy you could want, as long as you follow this rule: be there for your friends. South America was where we were originally headed, but I’d postponed that part of the trip and I knew it was going to nag on both of us over the coming months. Plus we’d covered Alaska and the northwestern corner of British Columbia far quicker than either of us would have liked. We’d stretched our bikes and ourselves, a bit, and started writing a book, or at least the first couple of chapters of a story that’s as yet unfinished.